A practical guide to the challenges and successes of global fundraising, written by an international team of highly respected philanthropy professionals and edited by two of the leading nonprofit thinkers, Global Fundraising is the first book to genuinely offer a global overview of philanthropy with an internationalist perspective. As the world becomes more interdependent, and economies struggle, global philanthropy continues to increase. More than that, nonprofits are taking up roles that have traditionally been filled by the government—including social welfare, healthcare, and human rights. Global Fundraising provides complete coverage of the implications of this growth for nonprofit culture and how it drives changes in fundraising practices. The book includes contributions by international leading experts Matt Ide, Mair Bosworth, Usha Menon, Anup Tiwari, Paula Guillet de Monthoux, Angela Cluff, Norma Galafassi, Mike Muchilwa, Tariq Cheema, Lu Bo and Nan Fang, Masataka Uo, Chris Carnie, Sean Triner, Andrea McManus, Marcelo Inniarra, Ashley Baldwin, Rebecca Mauger, YoungWoo Choi, R.F. Shangraw, Jr., Sudeshna Mukherjee, and Anca Zaharia. 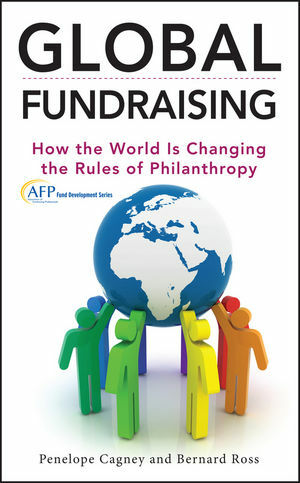 The book skillfully tracks how the world of fundraising is changing rapidly due to a number of factors including: continuing growth of great wealth; non-profit innovation emerging everywhere; growth of indigenous NGOs; increased professionalism in fundraising; and the value and role of new and social technologies. Written by a team of philanthropy leaders, Global Fundraising offers timely coverage of fundraising around the world. A must-have for INGO leaders and anyone, anywhere, interested in the future of philanthropy and effective fundraising practices. PENELOPE CAGNEY, MA, CFRE, is the principal of The Cagney Company. She has more than twenty-five years' experience on three continents as a consultant in fundraising planning and governance with organizations including the Musical Instrument Museum, Phoenix; CFRE International, Alexandria, Virginia; the Joffrey Ballet, Chicago; the National Cultural Center, Egypt; and the Charities Aid Foundation, London. She has taught nonprofit management at the School of the Art Institute of Chicago and American University in Cairo, Egypt. She is the author of Nonprofit Consulting Essentials (Jossey-Bass). BERNARD ROSS is co-director of the Management Centre, the UK's largest nonprofit management consultancy and training organization. He has worked in nonprofit management for nearly three decades and is a frequent speaker in Europe, the United States, and globally. He has tested his methods with organizations such as Greenpeace, Oxfam, Save the Children, the Red Cross, and others. He has written widely on strategy and change. His two previous books Breakthrough Thinking for Nonprofit Organizations and The Influential Fundraiser (both Jossey-Bass) were coauthored with Clare Segal.